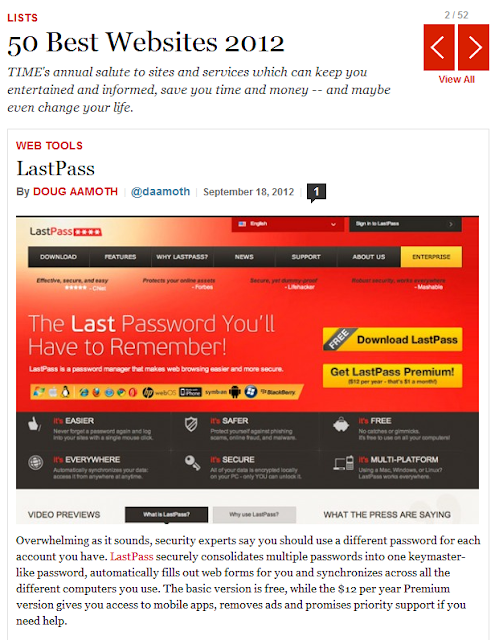 The LastPass Blog: LastPass Featured on TIME's 50 Best Websites List! LastPass Featured on TIME's 50 Best Websites List! But on a serious note, we're thrilled to be recognized as the leading password manager, and we continue to strive to provide a top-notch service that helps make online life a whole lot more manageable. And as always, we're thankful for our awesome users for their ongoing use and promotion of LastPass.